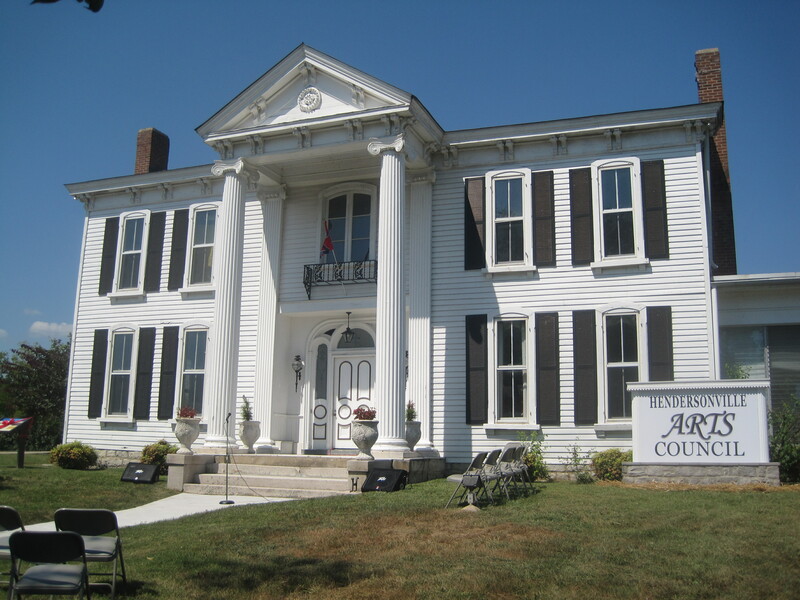 Yesterday I was honored to participate in the Civil War Trail dedication events for two antebellum houses in Hendersonville, which is a Cumberland River (now a lake) northeast of Nashville in Sumner County. The two houses are known as Hazel Path and Monthaven. Hazel Path is a two-story brick house, while Monthaven is a two-story frame house. 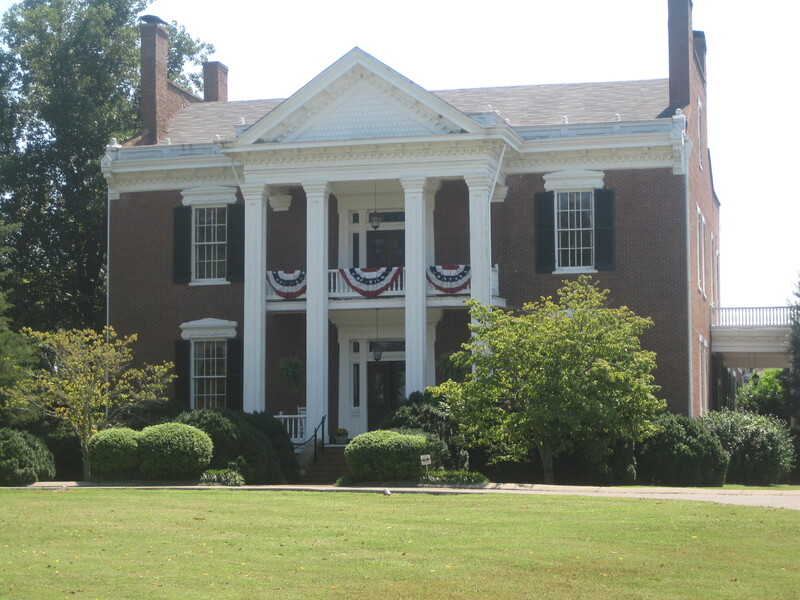 But both sare that defining characteristic of late antebellum Tennessee domestic architecture–a two-story Greek Revival style portico that dominates the building and gives it a sense of gravity, style, and class. Today it is difficult to see even imagine the rural landscape that both houses belonged to for most of their existence. Only with the onslaught of suburban growth and sprawl in the last 4 decades of the 20th century did the homes lose their essential sense of ruralness. Today a 1980s/early 1990s office park, designed in colonial revival style, surrounds Hazel Path on both its north and south sides. The house itself was restored into offices, and is well maintained by its owners. Monthaven’s conversion and restoration is much more recent story. It is now part of a city park, on the southern outskirts of Hendersonville, and has a public use as an arts center. There is still space to breathe at Monthaven but recreational structures are already in place and one wonders how long the open space around the house will remain. Both houses of course are divorced from the many outbuildings that would have served them in the 19th century. What struck me about both houses was the historical narrative both represent. The area is so changed it is difficult to even see a mid-19th past. But both houses are reminders of that, and both reflect the impact of the Louisville and Nashville Railroad on the region in the 1850s and especially during the Civil War. Monthaven stood near the railroad’s Mansker Creek bridge, a structure that became a place of conflict throughout the war for to knock out the bridge was to cripple the communication and transportation (even for a brief time) of the occupying Federal army. No battle was fought here, but men were often in conflict and house served both sides as a hospital at different times in 1862-1863. Hazel Path witnessed even more fundamental change. It too prospered as a plantation served by the railroad but those same tracks brought destruction during the war. The spot was such a good location, and the owner Daniel Donelson was such a prominent Confederate, that Federal officials designated it as a contraband camp and later a local headquarters of the Freedman’s Bureau. It became a place where freedom became a reality for many former enslaved Tennesseans. Too often we tell the story of the Civil War years solely through battlefields but Hazel Path and Monthaven are two significant survivors that tell a more basic truth–the war changed families, black and white, and changed the very nature how Tennesseans look at a place and recalled what it was and what it had become. This entry was posted in Uncategorized and tagged Civil War, contraband camps, Daniel Donelson, Freedman's Bureau, hazel Path, Hendersonville, Monthaven, Sumner County, Tennessee on September 7, 2013 by carrollvanwest.